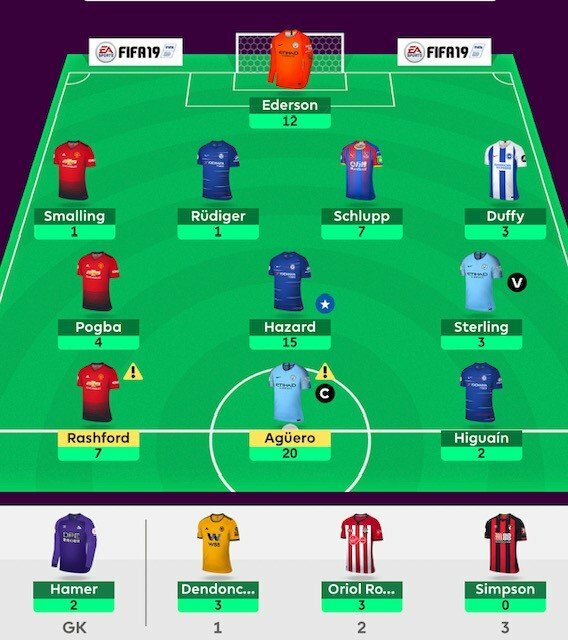 An absolute disaster of a free-hit double gameweek. How I have managed to drop from 36k to 50k with the choice of the all players in the game is beyond me but there it is. Luck did play a big part with a Smalling OG, Rudiger and Higuain being rested last night and the list goes on but no complaints, just not my week with a lot of 50/50s not going my way. Going into this weekend I do have a full eleven which is a good position to be in. My transfer will likely be Anderson to Fraser as a one week punt as I will be wildcarding in GW34. My captain will be Hazard with Salah as vice. I am hoping to claw some ground back with the potential for lots of hits to be taken this week for managers to get full elevens out. A really good week in TFF with Patrick Van Aanholt gave me a timely boost on Saturday with a great 12 pointer whilst my transfer in on Sunday (Azpilicueta for Pogba) also paid dividends with a 9 pointer off the bat. 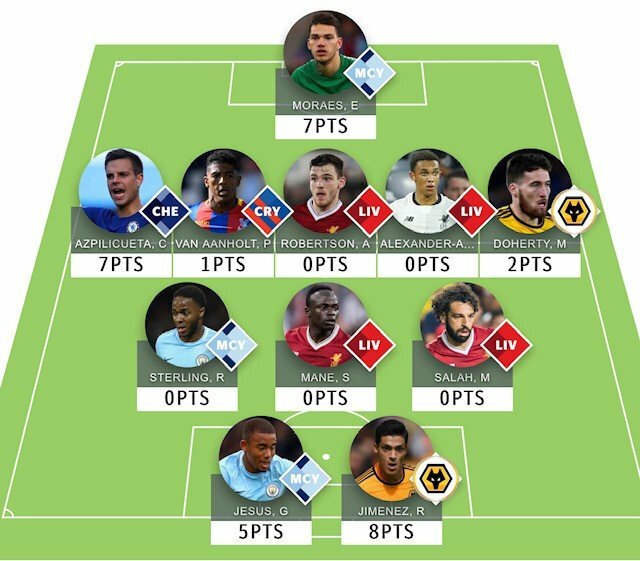 These points, alongside the usual suspects of Aguero, Robertson, Alexander-Arnold and Ederson returning boosted me up to around the 150 overall rank mark after the first set of fixtures for the gameweek. I made another transfer on Wednesday evening bringing in Jesus (3% owned) for Aguero for the plum back-to-back fixtures of Cardiff and Brighton which gave a small return and I’m hoping for some more on Saturday. After the Liverpool match tomorrow night some other teams have a good 3-1 over Liverpool (with the 1 being Chelsea) so I will likely make a further change to take advantage of this before probably using the remainder of my transfers over the next few weeks on bringing back Liverpool players from their run which starts with Cardiff on 21st April, and Man City players who will likely make the FA Cup final to boot. Kane is the only player outside of these clubs I want to be able to afford but I will need to be clever with my funds to fit him in for his great run-in. I am very happy with my team and remaining planned transfers and am hopeful to break into the 50 by the end of the season which is only 30-odd points away currently and would be my best-ever finish in a tough game. 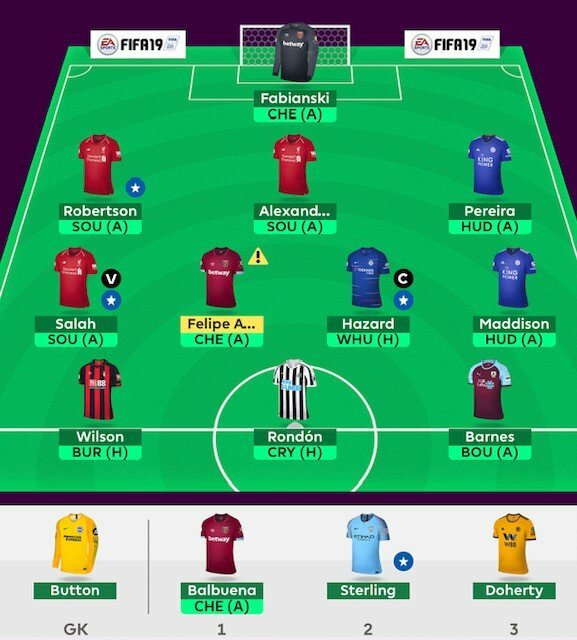 I made two transfers on Saturday, taking out Anderson and Almiron for Aguero and Valery with both returning immediately. 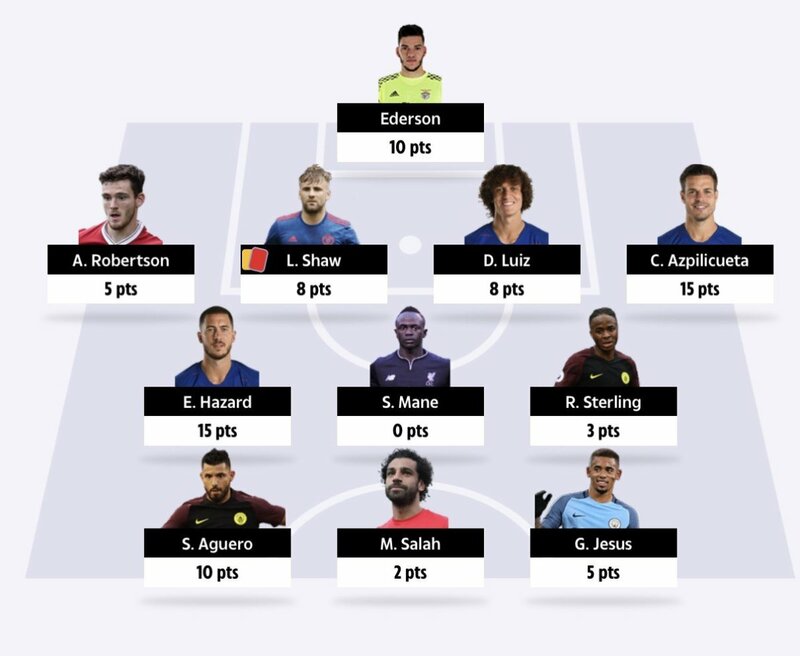 I rose to 17th overnight but then Salah’s dodgy assist put paid to that and I fell back to 22nd on Sunday with disappointing returns from Hazard, Luiz and three Liverpool players (Robertson aside). Monday night saw me change Van Dijk (risky I know) for Lacazette for the Monday night cap who duly returned with a goal which somehow kept me at 22nd overall, tough crowd! Following news of Aguero’s injury I switched him out for Kane and captained him, trying to steal a march but was sadly unsuccessful. I only have one transfers left now but captain-wise I have everything covered (to a degree), Brighton v Cardiff aside, until the end of April with Maddison and Lacazette being the key Leicester and Arsenal one gameday assets. I have banished dreams of winning the whole thing now but am still aiming for as big of finish as possible. My captains on the weekend will be Robertson, Maddison, Lacazette and Hazard. A good week with patience in Chelsea assets finally paying off. Keeping Jesus looked an OK move with Aguero being injured but he disappointed against Cardiff with just an assist. With FA Cup and European games this week I will likely leave the team as it is, Shaw aside who is banned for two games surrounded by Messi and co so will look for an urgent replacement there, maybe getting Jota back which will also leave me some budget to play with. An ok week with a small rise in rank thanks to Hazard and Azpilicueta who finally delivered. As above I will probably leave my transfers although Pogba has been poor and has some difficult games coming up so I may look to replace him with Jota also. This would then give a lot of scope to upgrade Pedro after his games next week. I will confirm all my transfers on Twitter (my Twitter handle is @Fergi222, give me a follow!) by the respective deadlines so keep an eye out. 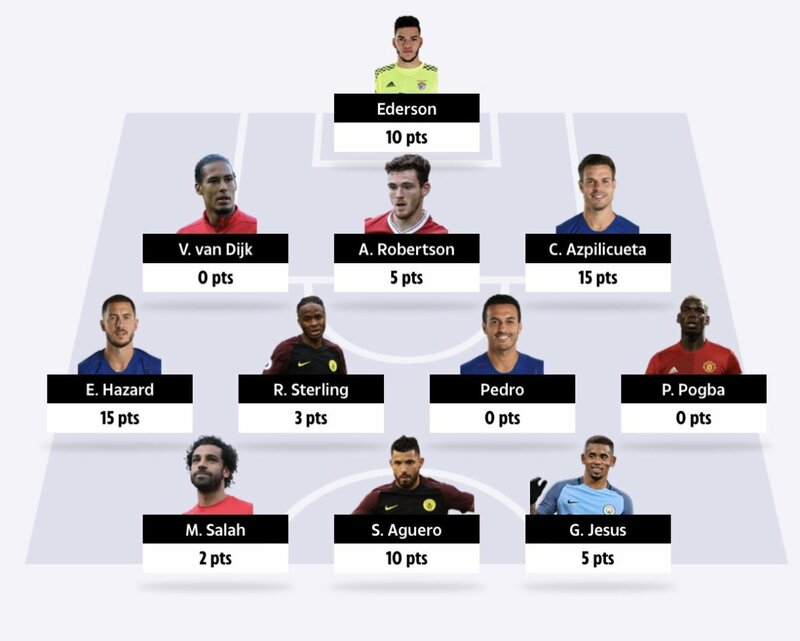 Good luck everyone for GW33! 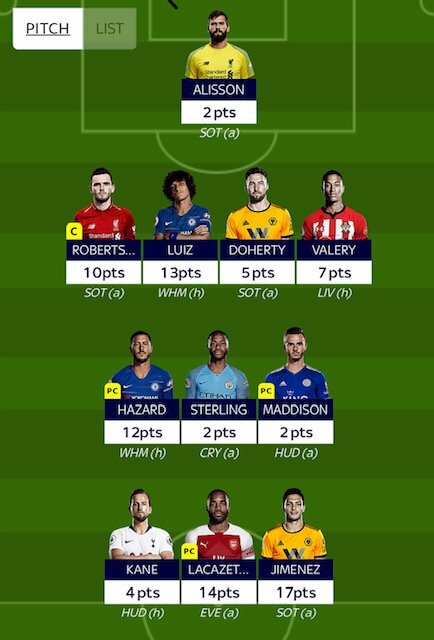 Not sure if to take out Vardy after this weekend but who to replace him with or do I take out Salah next weekend and replace with Kane? Andrew, I fel your pain. My 50/50 calls all went against me. DSilva instead of BSilva, Luiz instead of Azpilicueta, Batshuayi instead of Jiminez etc. Dropped from 5k to 8k, struggling to stay in top 10k. I thought you’re supposed to make up ground on a DGW? The last six weeks will be very tricky, all sorts of stuff going on (Champions league, Europa, FA Cup, 4th place, teams that are safe etc). Well done on TFF and Sky, though.